Newly returned to her home in Mayfair, Lady Emily Hargreaves is looking forward to enjoying the delights of the season. The delights, that is, as defined by her own eccentricities—reading The Aeneid, waltzing with her dashing husband, and joining the Women’s Liberal Federation in the early stages of its campaign to win votes for women. But an audacious vandal disturbs the peace in the capitol city, splashing red paint on the neat edifices of the homes of London’s elite. This mark, impossible to hide, presages the revelation of scandalous secrets, driving the hapless victims into disgrace, despair, and even death. Soon, all of London high society is living in fear of learning who will be the next target, and Lady Emily and her husband, Colin, favorite agent of the crown, must uncover the identity and reveal the motives of the twisted mind behind it all before another innocent life is lost. 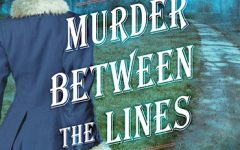 Writing Victorian thrillers seems like a strange turn for a former pharmaceutical rep (“a soul-crushing job”), but Tasha Alexander has a long love of literature and the late-Victorian period. While reading Gaudy Night, by Dorothy Sayers, she found herself inspired to try writing a novel herself. A lover of classical art and long fascinated by art forgery, she opted to try something different from what was out there and found success. Her agent, Anne Hawkins, one of the first to accept email queries, took her on three days after asking Alexander to FedEx her the manuscript for her first novel. A strong start at Morrow was followed by a move to St. Martin’s highly regarded Minotaur imprint (“You moved a series?” I inquired, incredulous, knowing how hard it is to do that.). There she’s edited by Charlie Spicer, a publishing veteran held in inestimable regard by all who know him. He’s “an old-fashioned, hands-on editor; he really digs into it. He wants to push you so each book is better, so it moves you to the next level,” Alexander says. I’ll leave it to you, the reader, to decide if she’s made it to that next level, but my money is on her. Tasha Alexander attended the University of Notre Dame, where she signed on as an English major (with a concentration in Medieval Studies) in order to have a legitimate excuse for spending all her time reading. She and her husband, novelist Andrew Grant, divide their time between Chicago and the UK. To learn more about Tasha, please visit her website.